Eurovision Song Contest winners Lordi are to be honoured with a cola named after them in their native Finland. 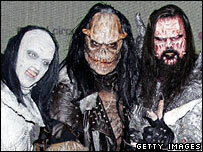 The hard rock group's singer, known as Mr Lordi, has designed labels featuring the five members in their monster masks and one of the whole band. "The Lordi phenomenon has brought the whole nation together," said Ritva Sinisalo, of drink maker Olvi Group. Lordi's song Hard Rock Hallelujah was the surprise winner at the 51st Eurovision in Athens in May. It was Finland's first victory in the event. Lordi Cola is due to go on sale next month. The band are always seen in monster masks and fantasy costumes, and perform stadium rock anthems which talk of "the arockalypse" and "the day of rockoning". They kick off their Bringing Back the Balls to Europe tour in Stockholm on 16 September, and play five UK dates in October.